The beauty and richness of Orthodox liturgy serves to draw the faithful into a living experience of the triune God, to unite them in faith and love with one another and with the saints of all ages, and to bless their lives with a profound sense of God's merciful and compassionate presence in their midst. Although Holy Communion can only be offered to Orthodox Christians who are prepared to receive it, all are most cordially invited—and even encouraged—to join the services of worship, to celebrate and glorify our Lord and Savior Jesus Christ. The Orthodox Church is the One Holy Catholic and Apostolic Church, founded by Jesus Christ and His apostles. It is organically and historically the same Church that came fully into being at Pentecost (Acts 2). Today, the Orthodox Church comprises the second largest Christian body in the world. Of the approximately 200 million people who identify themselves as "Orthodox" Christians, the vast majority live in Russia, Greece, Romania and other eastern European countries, as well as throughout the Middle East. Approximately 1 million Orthodox Christians live in the United States, historically and primarily concentrated in the Northeast, Midwest and California. The Orthodox Church is now growing most quickly in the South and West. Long known as "Eastern Orthodoxy" the Orthodox faith has established itself throughout the world, in North America, Africa, Australia and Western Europe. Small groups exist as well in Asia and South America. This dispersion or "diaspora" of Orthodox peoples intensified during the 20th century, particularly in the wake of the Russian revolution of 1917. Russian missionaries were present in Alaska from 1794, however, and Greek communities appeared in American port cities from about the same period. Orthodox parishes tend to be identified and organized according to the language in which services are celebrated and the national identity of parishioners. Thus they have come to be known as "Greek Orthodox”, "Russian Orthodox”, etc. While the Greek Orthodox are the most numerous in the United States, their parishes number many "converts": people who have entered the Orthodox Church from some other (or no) faith tradition. The same is true with the other two major Orthodox bodies, the Antiochian Archdiocese and the Orthodox Church in America. The latter was formed in 1970, by bringing together under common episcopal leadership (meaning "of a bishop or bishops") Orthodox faithful of Russian, Romanian, Albanian and Bulgarian origin. There are also many Orthodox Christians with Ukrainian, Carpatho-Russian and other Eastern European roots. Whatever their ethnic and linguistic background, all Eastern Orthodox Christians are in full communion with one another, insofar as their bishops are "canonically" recognized as standing in apostolic succession. During the first millennium of the Church's existence there was more or less unbroken unity among different groups of Christians. All were formally united in the one, undivided Body of Christ, although various groups and individuals separated themselves from that Body by teaching "heresies" (literally, "differing opinions", but the term signifies teachings that distort revealed Truth). The earliest apostolic age (first century AD) was quickly followed by an age of severe persecution that ended only with the conversion to Christian faith of the Emperor Constantine, after 313. From that time on, Christianity became the official religion of the Roman Empire. Gradually there developed five principal centers ("patriarchates") of Christian life: Jerusalem, Antioch (in Syria), Alexandria (in Egypt), Rome and Constantinople (Istanbul), each of which understood itself to be in organic unity with all of the others. Growing theological and political disputes between the bishops of Rome and those of other patriarchates, however, led to a tragic split between "East" and "West,” usually dated from 1054, with mutual excommunications between the bishops of Rome and Constantinople. From that time on, the separation between Rome and the other patriarchates deepened, and that separation continues today. Orthodox Christians accept the Bible as the Word of God and the ground of their faith and practice. The Bible, however, took shape within Holy Tradition: the oral and written "memory" of Israel and the early Church. To Jesus and the apostles, Holy Scripture consisted of what we call the Old Testament: the Law, the Prophets and the Wisdom writings of the ancient Jewish people. The New Testament writings came to be recognized as "canonical" (authoritative and normative) over several centuries. They, like the Old Testament books, were composed on the basis of Tradition. Orthodox Faith is expressed most succinctly by the Nicene Creed, composed by theologians who met at the first two (of seven) great Ecumenical Councils held in 325 and 381. Slightly different from the later Apostle’s Creed, the Nicene confession is essentially “trinitarian.” It declares God to be the Father and Creator of all things. It stresses the true “incarnation” of the eternal Son of God, who was conceived by the power of the Holy Spirit and born of the Virgin Mary, died and rose from the dead, ascended to heaven, and who will come again to judge both the living and the dead. It confesses the Holy Spirit to be equal in nature and honor with the Father and the Son, to “proceed” eternally from the Father, and to be the inspirational power behind God’s self-revelation. The Creed concludes with affirmations of faith in the One, Holy, Catholic, and Apostolic Church, in a single baptism for the forgiveness of sins, and in the resurrection of believers to eternal life. 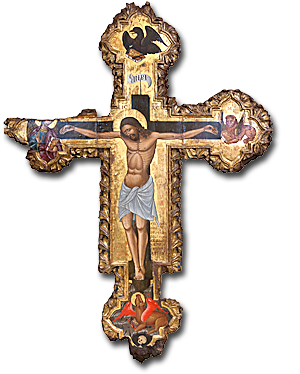 The major focus of Orthodox worship is adoration of God and communion with Him. The Church's faith is expressed in its liturgical prayer. Individual services derive from ancient Jewish services, taken over by early Christians and reshaped in the light of Christ and His resurrection. The "liturgical day" begins in the evening (see Genesis 1, "an evening and a morning, the first day"!) with celebration of Vespers. Following this are the office of Compline and the midnight office of Nocturne. Around daybreak, Matins is served, then First, Third, Sixth and Ninth Hours. On feast days, monastic communities, cathedrals and most parish churches celebrate the Divine Liturgy or Eucharist service, as all Orthodox communities do on Sunday mornings. 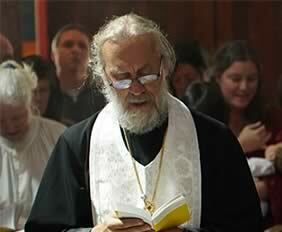 The Divine Liturgy may be considered to be the very heart of Orthodox life and faith. It is our sacramental union with God. It also unites us with other Orthodox believers throughout the world in a common celebration of the gift of Life offered to us by Christ's death and resurrection, by which the powers of sin and death are overcome. The Liturgy also unites us with the whole of the “communion of saints”—the departed martyrs, holy fathers and mothers of past ages—who join with us and with the heavenly host in glorifying God and receiving from Him the Bread of Life. Although Orthodox Christians often speak of "seven sacraments" (eucharist, baptism, chrismation, confession, marriage, ordination, unction), this is a Westernized approach to the matter. In fact, all of life is given to us in order that it composed by theologians might become “sacramental." Through prayer, participation in the liturgical services, ascetic struggle against our passions or sinful inclinations, and by gestures of loving self-sacrifice, we enter ever more deeply into communion with the God of love.